Beautiful rainbow chaser necklace with magnetic connection. The most advanced chaser necklace of its kind is here. Most websites offer something similar to our Chaser Necklace but we are the only site that delivers the latest in chaser technology. We've taken the best from the various Chaser necklaces we've purchased over the years and combined the coolest functions, most flexible tubing, and most reliable connections into one unbeatable necklace. Product measures 28.5 inches in length. Uses 3 AG13 batteries -- included. 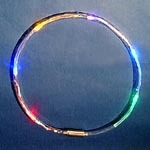 The still image below is an actual unedited camera shot of the 6 LED Chaser Necklace. The chasing light is so fast that even a normal shutter-speed camera shot makes all the LEDs look "on" at once!